Shoot now you have me with music in my head…sunrise, sunset, sunrise, sunset….swiftly fly the years…big sigh….but guess what my cochlear implant lets me hear voices great and music a bit electronic but pretty good……Went to the rookery yesterday just to see if I could hear the birds again….and sounds came from everywhere..it was awesome…like the first time!! Sorry , digressing, it was that sunrise, sunset at fault. LOL! Thank you! Nature helped with the lighting of course. 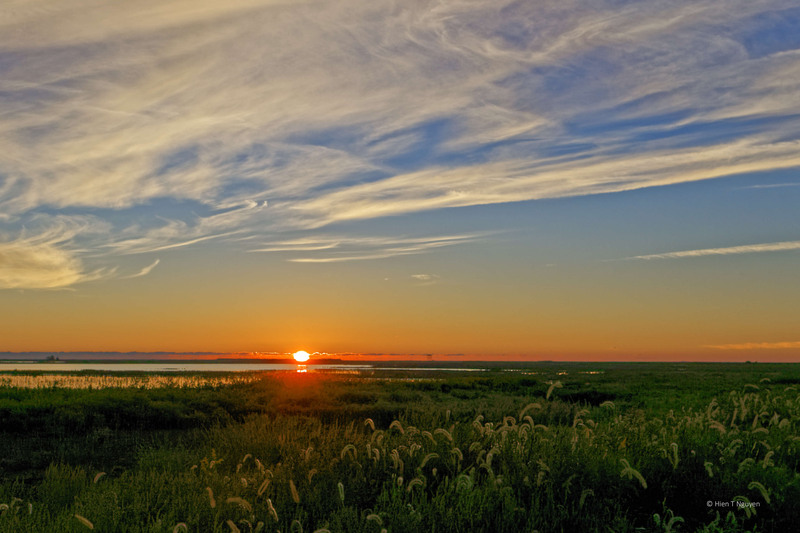 Your photographs are stunning Hien. 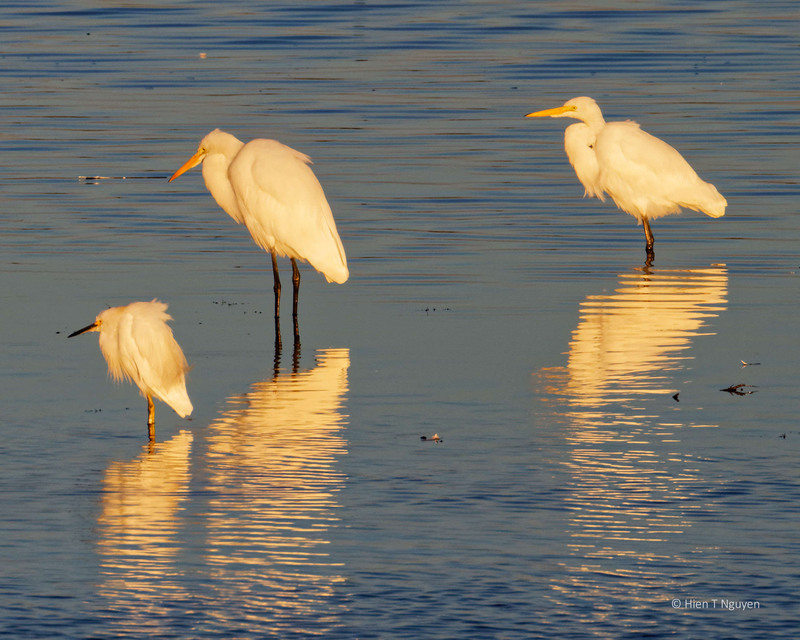 Love the quiet drama that each give us – the egrets scene is a stopper. Love this and happy to see your beautiful photography again. You do an excellent job with those sunrise/sunset landscapes, and I love the huddled egerts, looking almost yellow in that light. I absolutely loved these, they show why it’s important to be outside during both sunrises and sunsets, if we aren’t, we miss the magic of the beauty that nature provides us if we are there. Jerry, you are absolutely right! That’s why photography is a great hobby. Love it when the sun gives you a nice change on color, all sweet shots! Beautiful and idyllic scenes,Hien!Loved the golden-hued plumage of the birds and the magical tones of the sky.Both are so very special and painterly! Maybe these sunrise and sunsets can compare to those of Greece. Thank you for commenting, Doda! Nice catch the magic moment of Mother Nature. Well done. 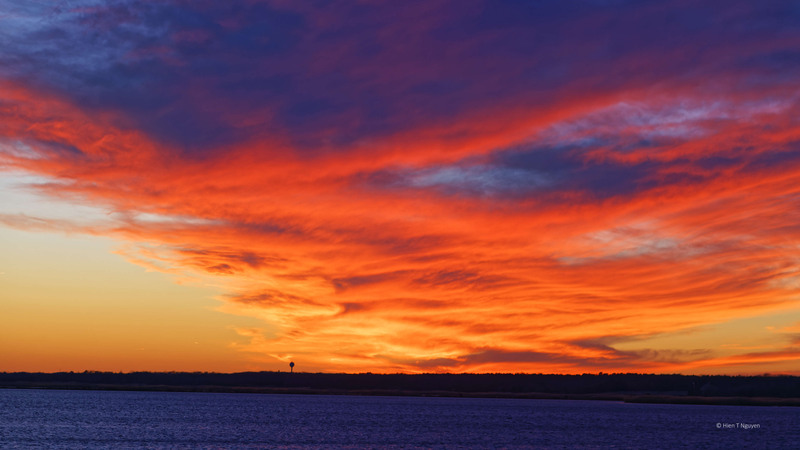 How wonderful that you get to experience such stunning vivid sunrises AND sunsets. Beautiful photos. Stunning photos! The colours are amazing! That’ right, Jim! At sunrise people are still getting out of bed, and at sunset must hurry home. In both instances I found myself alone with just the birds and ducks for company. Being without others around us reminds me how I am part of a larger universe. Beautiful photos red sun sets and golden hour colors on Snowy and Great Egrets.